There are game cakes, and then there are Game Cakes, the ones that require capital letters, applause, and perhaps a brief moment of teary silence. This Super Mario Galaxy cake is definitely the latter. Constructed of pure greatness, actual cake, fondant, Rice Krispy squares, fiber optic lighting, and pure love, the cake features several Super Mario Galaxy features and characters, including the under-glass pill-shaped puzzle area and Princess Peach's castle. And then just when you think it couldn't get any better, the damn thing moves. Hit the jump to see the cake in action. 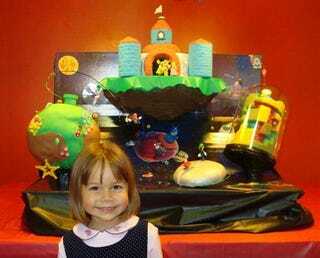 The cake was designed and implemented by a man named Will, who suckered his daughter Hannah into the Super Mario Galaxy creation for her 4th birthday party. His trickery cost him 7 batches of Rice Krispy treats and 7 different cakes, but the results are simply amazing. I had an extremely hard time deciding what to put on the cake. If you've played the game you might understand. There are so many levels its ridiculous. I had to have the castle and one round world. And for some reason I got bent on having the glass pill looking planet thing which I just thought would look cool on a cake. The silver disc was an add on at the end of my decision so I could add Luigi and some Galaxy like spinning. Seriously, I had the worst time cutting out worlds I wanted on here.